It's not every week that you see a dog covered in disco lights, discover the equation that might make time travel possible and have Twitter turn all your bookmarks into lovey-dovey love hearts. 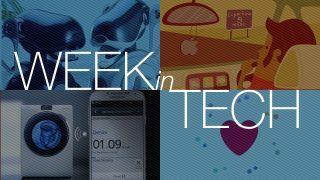 All those things happened this week, along with the revival of the dreaded Snooper's Charter, Microsoft getting in a big huff about OneDrive abuse and Facebook pretty much owning the planet. Not only that, but robot dogs too. It can only be Week in Tech! Remember the Snooper's Charter, the UK government's failed plan to monitor everybody's internet activity? Well, it's back – and this time it looks like it's going to become law. As Gary Marshall explains, lots of people think that's a bad idea, and not just because it means firms such as Talk Talk getting the job of protecting our most private information. "The usual bogeymen have been trotted out – we need the new powers to fight ISIS and the reanimated corpses of 1970s BBC children's programme presenters – but the communications data will be available to your local council, to the taxman and to 38 other public bodies," Marshall says. All together now: No no no no no no no no no no no no there's no limits! Don't try singing that round at Microsoft's house, though, as you'll be thrown out: thanks to alleged bad behaviour by a tiny minority of OneDrive users, the unlimited storage plan has been cut to 1TB, the free storage has been cut from 15GB to 5GB and the 15GB camera storage bonus has gone forever. You'd think Microsoft of all people would have had the server capacity to cope with a handful of unusual users. Do you like Twitter's favourites icon for bookmarking interesting tweets? Tough luck: it's become a heart, renamed Like and it means everything you've favourited over the years has become a Like whether you want it to or not. It's all about attracting new users, although you've got to wonder what kind of people Twitter's trying to attract if they find a star "confusing". In recent years retailers have been quick to climb on the Black Friday bandwagon – so it's interesting to discover that many retailers really, really hate it. James Rivington explains: "It demands they discount products and thus trim their already small margins at a time when customers would be spending money for Christmas anyway, as well as forcing a drastic rethink of stock levels, staffing in warehouses and in IT departments and all sorts of other logistics at a time when they'd rather be preparing for Christmas." Rather than create new demand, Black Friday appears to move it forward a bit – and that means it's only the retailers with the deepest pockets who'll really benefit from it. Fancy giving your dog – yes! – a pupgrade? We've scoured the web for the very best dog tech money can buy, and in many cases by "the very best" we mean "the silliest." If you fancy making your dog into a digital disco, we have all the tech you need right here. What about digital dogs – weren't we supposed to have robot pets by now? Gary Marshall explores the rise and fall of robot pets, and the likelihood of their rebirth. "It's been nine years since the last Sony Aibo left the litter," he says. "Imagine what one designed with today's tech could do." Wi-Fi. It's great! It works! It's completely unnecessary in a pair of shoes! Gary Cutlack reckons that some firms have gone too far in their desire to tick "Wi-Fi" on their product spec sheets, and he's naming and shaming the worst offenders. On your bike, Wi-Fi bikes, and take your Wi-Fi clothes with you! Facebook reached a new milestone this week, with a billion people logging in to the social network this monday. That's one in every seven people on Earth, which might explain why we haven't cured cancer, stopped climate change or found a way to live forever yet. There was no particular reason for the milestone – it wasn't a holiday or significant date; as Farrah Khan says, "there was just a lot of people using Facebook." Fancy making a time machine? All you need is a quarter of a million dollars and Ron Mallett's phone number. Mallett has discovered an equation that could make time travel possible. It's all about using light to alter time: "by using a circulating beam of laser light, I have been able to mathematically show that this can lead to a twisting of space and time," he says, before nipping back a week to play the lottery. If the equation is correct, then it should be possible to build a machine to receive messages from the future. Emphasis on the "if". If conversations between Steve Jobs and Nest designer Tony Fadell had gone differently, Apple might be a car company. That's what Fadell says anyway, recalling long walks with Jobs when he was Fadell's boss in 2008. They discussed every aspect of the Apple Car, and if they'd decided it was practical it might have become a project nearly a decade ago. Sadly Apple was "so busy… so constrained" at the time, so while Jobs was keen it just wasn't practical. Maybe it'll happen on Tim Cook's watch instead.